In small bowl, stir together cream cheese and dressing mix until well blended. On 1 side of each bread slice, spread butter evenly. On unbuttered side of 2 slices, generously spread cream cheese mixture. 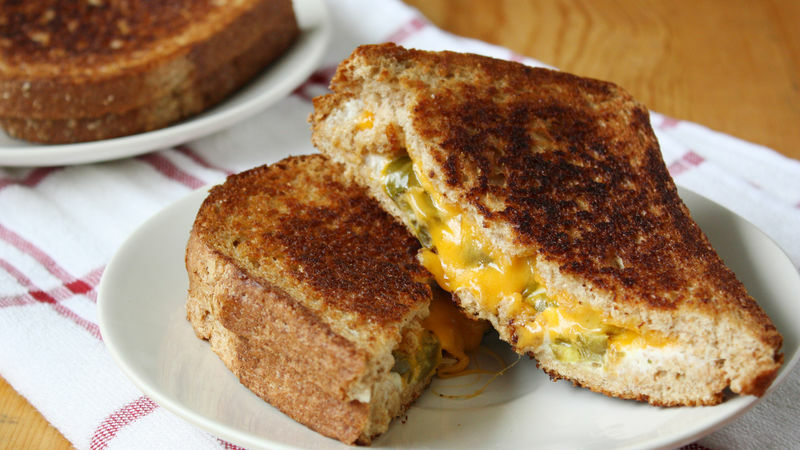 On each cream cheese-topped bread slice, layer 1/4 cup jalapeños and 2 slices Cheddar cheese. Top with remaining bread slices, buttered side up. Heat large cast-iron or nonstick skillet over medium heat. Add sandwiches; cook about 5 to 7 minutes, turning once, until cheese is melted and bread is golden brown and crisp. To serve, cut each sandwich in half. For added heat, leave the seeds in the jalapeños, and add 1/2 teaspoon liquid from the can of jalapeños to the cream cheese mixture. Add sun-dried tomatoes to the sandwich for extra color and flavor.